Trilogy ...nice. Definitely looking forward to this even if it's a bit of a long wait. I hope BDs comes out fast as well when it's released. Thank god it's a trilogy. One movie would've been sort of pointless; would've been rushed to hell. Wow, that key artwork is gorgeous. It's Ufotable. What do you expect? And there it is. A trilogy is cool. Making sure you get everything you want. 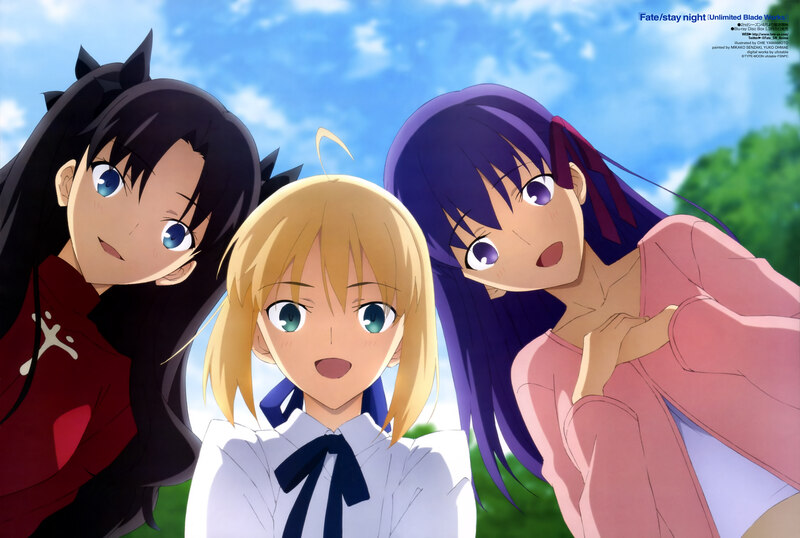 Hallelujah if it was as crammed as the first UBW movie id cry. I was skeptical when they said this would be A movie. That was most likely by Tabata. Tomonori is miles better, he did that new HF key art. Literally every bad design in UBW is Tabata's fault. Tabata was aiming for a "younger look" on the characters, and they ended looking fu**ing weird. So this will be a long wait. I hope it's worth it. By the way, I think that summary is a little weird. It should be something like "Sakura unwillingly becomes a centerpiece of the Holy Grail War as the darkest secrets of the Matou family unfold. A cruel fate now awaits in Shirou's path". Otherwise it's like you're just spoiling (and badly, since that's not exactly how it goes) instead of giving a summary. Doesn't look that bad, just weird angle choice and Rin's eyebrows don't match the expression. Nothing amazing, that's true. Assuming each movie is about 90 minutes long and there are three. It is basically a 12 episodes series runtime, why not just make it a series and air it on TV and have it concluded in 4 months. Instead of releasing the movies over a year long period. I know what movies get higher production value then TV series but Futoable pretty much has consistent quality of thier shows from both cinematic endeavors and TV broadcasts, so I don't believe that that is a viable argument in defending going the films route. Credits are in the corner. It says Chie Yamamoto. Can't find much on her, but she also did this one, which also has a few off-looking faces. I believe the reason they gave was over content concerns. There were a few scenes they might have had to tone down, but in a movie they obviously don't have to worry about that. Can't find the source, but I'm pretty sure I recall hearing something along these lines said at some point. Cause Movie trilogies seem to be the new thing in this mass marketing styled industry since it allows producers to essentially double triple dip where series with fanatics guaranteed to splurge money on it are concerned. You get three separate box office grabs and three separate BD grabs effectively earning you 6 times the money in theory. This is an increasingly greed driven industry so it's just how it goes now and probably the only real reason. Yep. I don't have the source either, but yeah, that's the reason. The content in Heaven's Feel would need to be heavily censored for a TV broadcast, so this is a much safer way to go. Also, Ufotable works better with a movie production schedule, in my opinion. You realize that that's a magazine spread, not key artwork, right?